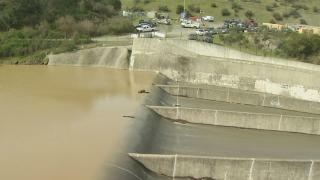 File image of Anderson Reservoir in Morgan Hill. The Bay Area could soon welcome a new reservoir, and it could be one of the largest of its kind in the region. Water officials in the South Bay are in the beginning stages of conjuring up a plan to build an $800 million dam and reservoir in eastern Santa Clara County roughly 10 miles west of the San Luis Reservoir along Highway 152, according to the Mercury News. The new body of water could either be created in unison with the existing Pacheco Lake or just upstream, according to the newspaper. If constructed, the reservoir would be able to hold 130,000 acre-feet of water. One acre-foot is equivalent to 325,851 gallons of water. For comparisons sake, Anderson Reservoir in Santa Clara County houses 90,000 acre-feet of water. Paid consultants are currently looking at the plan's feasibility, but financial headaches and geological issues could ultimately dismantle the effort, according to the newspaper.